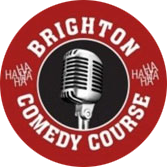 Exciting news, Brighton Comedy Course is now booking now for the Advanced comedy course. This for students who have graduated from BCC 8 week course or for comedians who have experience working the circuit. The course will run for 5 weeks, giving students plenty of time to write and rehearse lots of new material. There will be less theory and more writing and rehearsal time. For more info have a look on the course page. To book now go on-line or drop me a line with any questions. Gift vouchers are available too. All details are in the Fringe brochure- shows start this weekend-there’s some quality comedy, lots free too. 1. Luisa Omielan-Show’s called All right ladies- very funny girl, saw her last year, worth a watch. Free and non ticketed. 2. The Brighton Comedy course Debut gig (Pick of the Fringe.) 10 new comedians ready to take the stage at Funky Fish. Friday 2nd May. 7.30pm, £7 on door. 3. Andrew Ryan- An Irish funny guy-what’s not to like? free and ticketed. 4. Humans. funny man Chris Stewart and the hilarious Phil Jerrod, who as well as coming from Brighton Comedy Course was also signed up this year by the agents Off the Kerb. 5. Muffraggette- Irish and one of the funniest stand ups females I’ve seen. £5 on the night. The half way mark already? We are almost half way through this 8 week course. It goes so quickly! Everyone in the class is making great progress. Some have said that they can feel their confidence growing all the time which is fantastic to hear. Last night we looked at body language and integrating improv into our comedy sets. It was a fun night with some well deserved drinks at the end. It’s all about the balance! There’s more hard work ahead as we head for the graduation night on Friday the 2nd of May. A new bunch of students started the 8 week comedy course last night. It was a full house for the first course in 2014. Every one of them stood up and performed for the first time after a short material writing exercise, and I have to say the standard of delivery was pretty impressive. There was one, (there always is) who thought that comedy was all about the birds and the booze. I had to break it to him that there’s a lot of hard work, writing and editing ahead and then maybe the booze and birds! There were some great lines and I’m thoroughly looking forward to seeing what develops. I’ll keep you posted on the blog. Well done all-great first night. 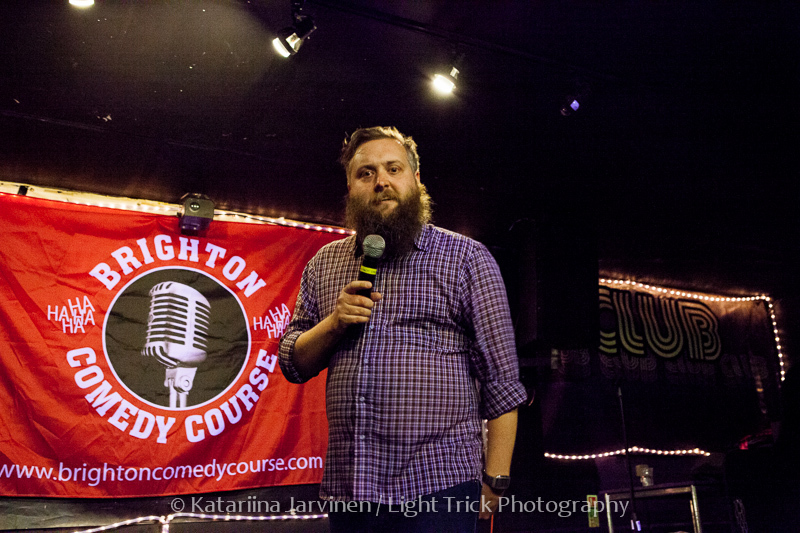 Phil Jerrod graduated from Brighton Comedy Course in 2012. I must say he did shine and I knew that with hard work and determination that Phil would make it to the big time. Well, talk about fast track, they say rule of thumb is around 8 years for a comedian to work the circuit and make their mark. In less than two, Phil has been signed up by one of the biggest agencies in Britain, Off the kerb, agents of Dara OBriain and Jo Brand among many. I am so pleased for him and know it won’t be long before we see him on our screens. Look out for him on Mock of the week, bearded fellow. Well done Phil. Last night was a fantastic graduation show. There were a few butterflies among the students but generally they were confident and on good form. Zack Ward was the first act to take the stage. Zack is the youngest student who’s ever been on the course at 19, he was engaging and warm. His delivery was natural and he really hit home with the audience. Peter Wood (aka Woody) went on next and delivered a mixture of one liners and retro jokes that had the audience chuckling away and the gig would not have been complete without the story of the X wife. Nick Lazar delivered his set with confidence as he observed the differences between men and women, always a subject for laughs. And who would have thought that the Incredible Hulk and masturbating could be put in the same joke? Amazing! After the break Jo Wonder ascended on the stage in a white veil suited to the dead character she plays. With her dead pan delivery and strong Brummie accent she he soon had the audience laughing along and participating in her act. I think what I love most about these nights is seeing students who I’ve been working for 8 weeks complete their mission and get on that stage. All of them were beaming when they come off. The diversity of the acts just makes it so much more enjoyable too. It’s the ‘Stick in On’ of Comedy. You never know what’s coming up next. Well done to all, you did me proud. You can see the performances soon on You tube Brighton Comedy Course. We have just over two weeks before the class perform at their graduation gig in front of a live audience, that gives the students time to make the changes and tweak their material to its very best. 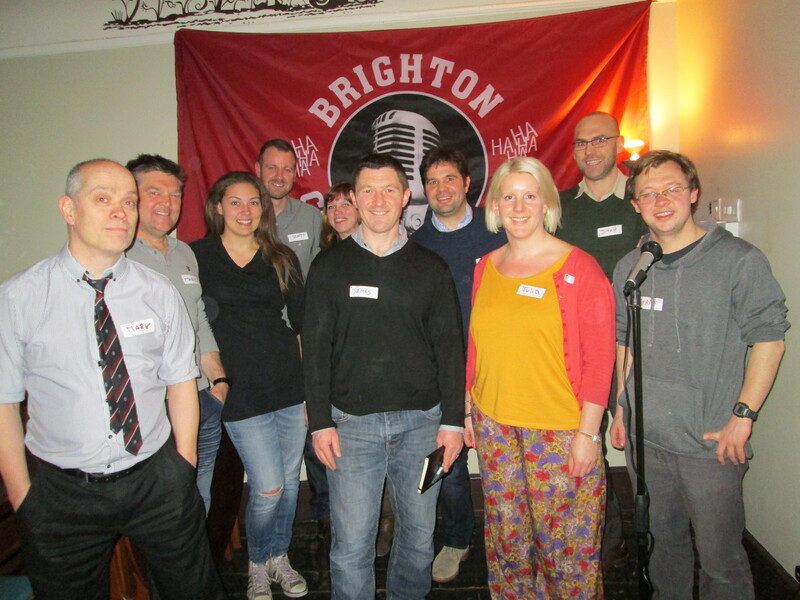 After the one on one’s and performance section we went on our away day to see local comedy in Brighton. A night at Verdict was a great idea. I recommend it as a venue. The standard of comedian was great and the students watched the very techniques we had just been discussing in action. A practical and very fun night out. If you would like to come and watch the graduates take the stage for the first time. The gig is on the 12th December at 8pm at Funky Fish, Marine Parade, Brighton. This week’s class was a real treat. Most of the class had spent the week working hard on their material. There was a great array of potentially fabulous material. We looked at different styles of comedy and got an understanding of the pros and cons of using each. We also looked at using improv in comedy. We have Dan Flanagan, Zak Ward and Indalo Pahana talking about their experiences on the course so far. This year Brighton Comedy Course is working in conjunction with Madeira Hotel to bring a Christmas night you won’t forget with top comedians providing the entertainment while you enjoy your Christmas dinner. We have the fantastic Pierre Hollins and the very funny Dave Thompson among the acts. There is a DJ after playing disco, funk and soul. For Christmas bookings contact Madeira Hotel on 01273 698 331. 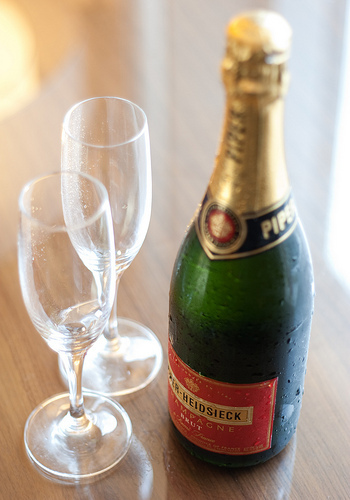 Madeira Hotel has kindly agreed to give away a bottle of bubbly to one lucky winner. All you have to do is Retweet any of our Tweets mentioning our Christmas Cracker Comedy Nights, or Like us on facebook.com/brightoncomedycourse to be entered. The winner will be announced on Twitter, Facebook and www.brightoncomedycourse.com on the 1st of December. Good luck! 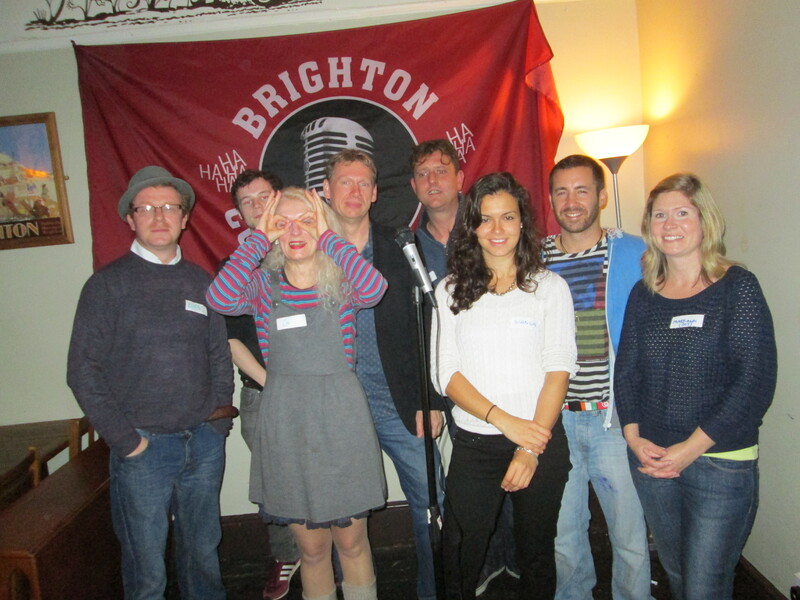 Last night Brighton Comedy Course welcomed its new recruits for the last course of the year. The course was full to capacity with a few last minute applicants. The objectives of the class were varied, one wanted to be a better teacher (to scary secondary kids), several of the class wanted to beat their fear of public speaking and there were those who want to go on to be stand up comedians. The team gelled well and a few laughs were had. We looked at the role of a comedian, the ups and the downs. One student, who shall not be named, confided that his idea of the upside of the job would be the groupies. Clearly a man! We spent the rest of the class concentrating on material. The class quickly gathered that there is comedy in everything, so many subjects to choose from. I was so impressed that every single one of them, after just ten minutes of writing material, got up and performed in front of the class. I’m really looking forward to next week to see what comedy gems they come up with. Roll on Graduation day where they’ll take the mike in front of a live audience. I can tell already that they have what it takes to do it, helped by the encouragement of the class mates and the hard work that they’re about to put in. Well done all. The journey has just begun.